Sometimes I get tired of painting, but I want to do something creative so I get crafty. I’ve enjoyed craftiness all my life – but kind of weird craftiness. 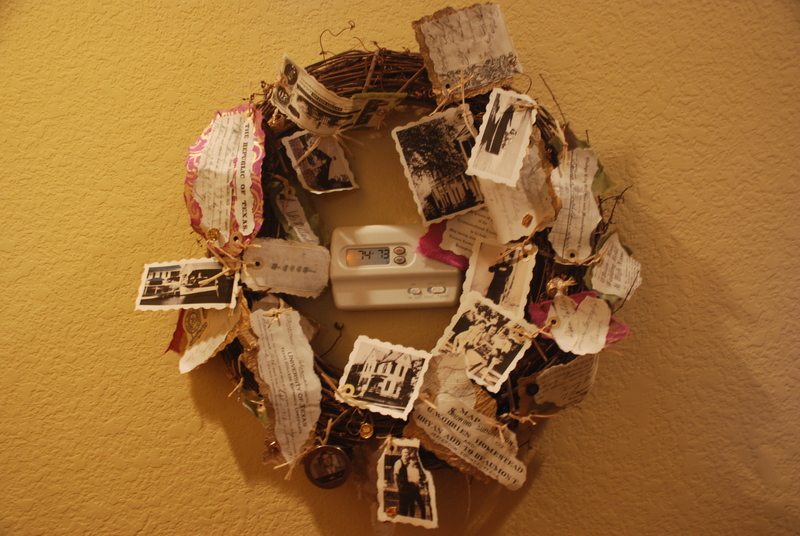 The latest thing I made was sort of a “memorabilia wreath”. My family is blessed to have gobs – and I mean gobs – of old family photos and written bits and pieces. And we actually know who the people are in the pictures! I had made a garland of sorts as a Christmas present for my sister a few years ago using some of this material. I didn’t want to do exactly the same thing for myself so I combined copies of old photos (scaled down), a copy of Confederate money along with other trinkets and then tied them all onto a grapevine wreath with raffia. Some of the trinkets are my dad’s college ring (and mine, both from the same uni), my dad’s years of service pins, his “ID badge” (that’s way cooler than our modern day versions of a laminated picture on a lanyard) and various sorority pins from my mom and grandmother. . I hung it on the wall surrounding my A/C/heat control panel which sounds kind of strange, but I was running out of wall space and the controller sort of blends in with the rest of it. From a distance, it offers just a texture but gets more and more interesting as you get closer. It’s a great way to display and enjoy some of those odds and ends that if we’re lucky, we have collected up in a drawer or a box. And I’ve seen it! It is a wonderful memorabilia wreath. So great to take a break from painting sometimes and do a completely different creative project.